2014 IEEE 3rd Global Conference on Consumer Electronics (GCCE 2014) is an annual international conference sponsored by IEEE Consumer Electronics Society. This is a sister conference of the International Conference on Consumer Electronics (ICCE), which has reached a remarkable 30th anniversary milestone in conjunction with CES in Las Vegas, USA. On behalf of the organization committee, we would like to thank you for attending IEEE GCCE 2014, Tokyo, Japan. We hope you enjoyed this conference. Also special thanks to the hard working volunteers who produced our conference and made it success! We have uploaded the photos of GCCE 2014 here. Enjoy them! We are looking forward to seeing all of you at GCCE 2015! The proceedings was published on IEEE Xplore. Please visit here. IEEE CESoc TV is here. It includes many videos of GCCE 2014. Enjoy! The conference report is here. It includes many photos of GCCE 2014. Enjoy! Photo Gallery is here. We are collecting photos of the first day, i.e. October 7. If you have them, please send to support@ieee-gcce.org. As you know, Typhoon Phanfone will hit Tokyo today (October 6)! It would cause plane and train delays and cancellations. If you have any problems, please do not hesitate to contact us at support@ieee-gcce.org. Take care of yourself. Join and report your memory of IEEE GCCE 2014! Opportunities of On-site Job for Foreign Students! GCCE 2014 offers job opportunities for foreign students as our financial support. Phototakers, timekeepers, ... and so on! If you (who are a foreign student) want to get it, please let us know by clicking the following. Thank you for your interest to Tokyo Bus Tour! The steering committee has decided to prepare one more bus. This enables up to 100 persons to participate! Accepted authors who needs a visa: Visa issuance usually takes longer time. Register now and request visa! Introducing a Sister Conference: ICCE 2015! Submission deadline of IEEE ICCE 2015 is extended to 11th, August.! Two-page manuscript is also acceptable. 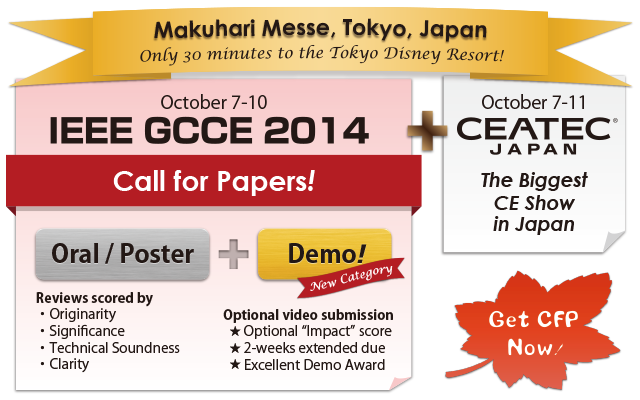 GCCE 2014 is asking for submissions of technical papers for Oral, Poster and Demo! presentations. Student papers are particularly encouraged. All presented papers of orals, posters and demo!s will be submitted for inclusion to IEEE Xplore. The IEEE GCCE 2014 will bring together top technical professionals from the consumers electronics industry and academia to exchange information and results of state-of-the-art work on systems, circuits, technologies, processes and applications. Attending GCCE 2014, researchers, system developers, and service providers will be able to share their ideas, designs, and experience in emerging technologies. Please join and experience the powerful synergetic effects of GCCE and CEATEC JAPAN in 2014! For more details, please see Regular Session Topic List and Special Session pages. © Copyright 2011-2014 IEEE GCCE All rights reserved.